Among the treasures we encounter while on a Lois McClure adventure are the people we meet who have some sort of personal connection to or special interest in the system of canals and natural waterways on which we travel and the industries and cultures of the people living along these shores. William, “Bill”, H Leighton and his wife Bertha are such treasures. While moored beside the H. Lee White Museum on the West First Street Pier in Oswego, NY, we were invited to a special exhibit by a local artist involving Tug Boats. Mercedes Niess, Executive Director of the museum, led us to the specially prepared hall where Art Cohn and I were greeted by William and Bertha Leighton. We were stunned when we saw a model Tug Boat which was the centerpiece of the exhibit. The piece is impeccably made; to describe it as ‘Museum Quality’ is not praise enough. Art and I enjoyed a conversation with Bill as we learned that his inspiration developed as he watched and studied boats in the Oswego harbor. He told us how and when he built the model and related a touching story about the model. A former [unknown] crew member of the Tug Catherine Moran saw the model, without fenders, while it was on display at a previous venue and apparently, was very inspired by the model. Some weeks later, Bill received a package in the mail and upon opening was surprised to find a set of handmade, miniature fenders made by that former crew member. They fit perfectly and there are more of them stowed in the hold of the model. 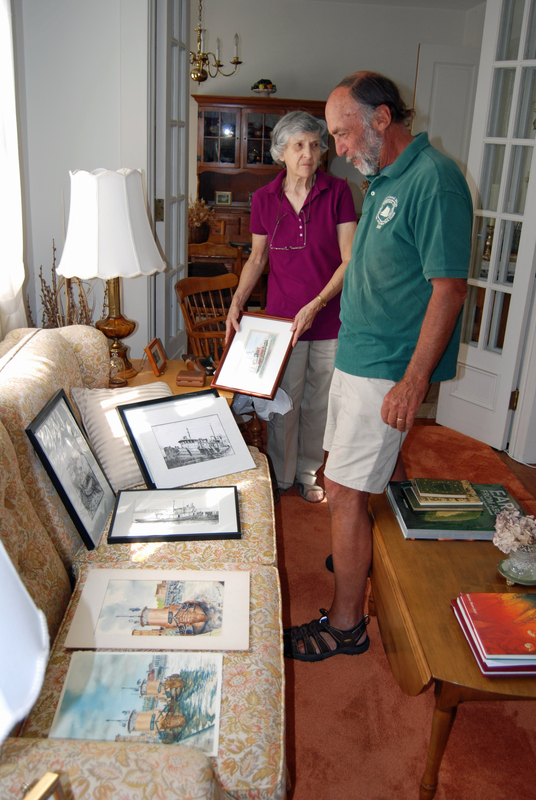 Bill and Bert also explained that they have more models and artwork at their home and invited us to come for a visit. The next morning, we arrived at their home and were shown two more incredible Tug models, numerous watercolor paintings, pen and ink drawings and more. Thank you, Bill and Bertha, for sharing so much with us.